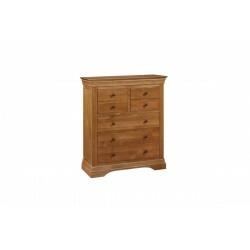 Complete any bedroom set with a stylish chest of drawers in a range of sizes and colours. Choose from a wide chest of drawers to a tallboy, finding the perfect match for your bedroom has never been easier at Bolands of Gorey. The Slaney Collection is made from an attractive white oak and veneer. The range is treated with an.. This is a stunning collection of bedroom furniture. With its smokey oak tops, painted finish and cur..